The Journey is the Reward. : Is Trail Running a Trend? Is Trail Running a Trend? I love road running and I love trail running. I love each for different reasons. I love road running for the ability to get completely lost in my own thoughts and for the ability to completely tune into my body. When I run on the road I am able to have 'out of body' experiences..... I am so focused on my thoughts, that I no longer feel my body. This euphoric feeling makes road running fantastic! I love trail running for the fact that I have to become totally aware of my surroundings. Trail running requires a different focus. The free-form running and the exhilaration of the downhill descent brings me back to my youth. The feeling of being a child juxtaposes the concentration aspect that comes with being an adult. Let's face it: we didn't concentrate much as kids because we weren't afraid of falling down.... if we fell, we would brush ourselves off, get back up, and go. Trail running is energizing! Do you love to run trails or on the road? Why? I agree with you on both, but I like running on the road for my training runs because I can "zone out" and just let my mind wander. I enjoy trail races because it makes you focus even more about your surroundings and trail runners seem to be more about the experience than trying to beat a fellow runner to the finish line. 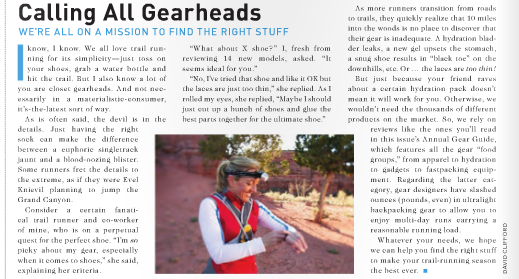 They both can be fun … I use trail running to re-energize my batteries, it makes me a stronger runner because sometimes road running gets too boring. Great topic, fantastic blog and I love the pictures. That's a good point about trail running Derek... there really is less competitiveness! I think Trails are becoming more popular as a means of escapism from the rat race and everyday life. Personally I prefer trails for the variety, peace and quiet, and it's more forgiving on your body. Although you have to concentrate on what you are doing more with trail running, I find this almost hypnotic, and the perfect distraction from normal life. It clears my head far more effectively than road running. For me Trails are about enjoying the experience and time in the outdoors, whereas road running was always about pace, Heart Rate, running negative splits, and all the other stuff which can take the enjoyment out of running. Not only that where I run I come into contact with Kangaroos, Goannas (big lizards!) and Cockatoos, which you don't get running on the roads. I'd be just fine if I never ran into one of those. Yikes. The roads are ok but the cars and people are a distraction, I do like the footing as it does allow me to look around. BTW, welcome to the Just Finish crowd. Thanks for the comment and the warm welcome Mike!